The devil is in the details of the new horror movie It Comes at Night, a $5 million production that opens in wide release today. The plot’s rough sketch will sound familiar to those familiar with the genre, especially the turns it’s taken in recent years: A family that’s holed up in the middle of nowhere fights for survival during what seems to be an outbreak of some sort of disease that has seemed to cast apocalypse on the world. The movie isn’t averse to tropes (it opens with the family killing a recently afflicted member), but it is terse when it comes to explanation (right down to the vague “it” of the title). What separates It Comes at Night from typical zombie stories and other post-apocalyptical fare is its deep investment in the psychological manifestations of such a horrific scenario, which director Trey Edward Shults renders vividly, even when he’s reveling in ambiguity. 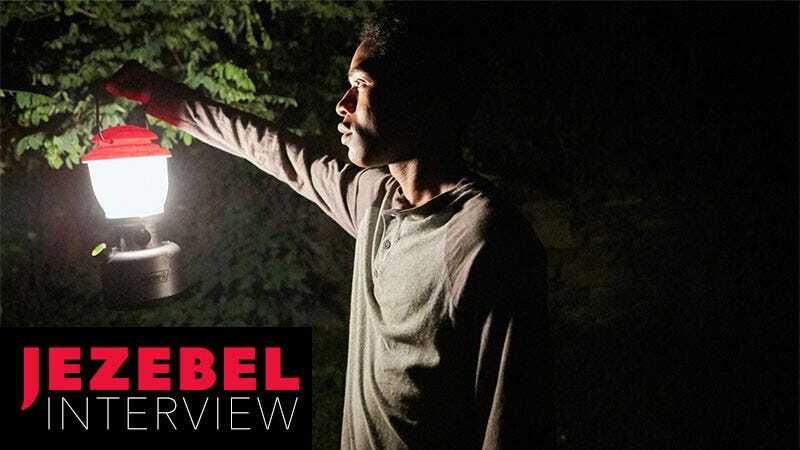 The movie disorients not just via the palpable paranoia from Paul (Joel Edgerton), a patriarch whose overprotective tendencies are well-intentioned but flawed, but also by weaving in and out of the nightmares of Paul’s son Travis (Kelvin Harrison Jr.). It Comes at Night is not just scary, it’s deliriously so. In refusing to hit his audience over the head and having faith in its intelligence, Shults has made a movie that works as the perfect counterpoint to the very dumb, other horror-ish movie that comes out today, The Mummy. It Comes at Night was inspired by the death of Shults’s father. Jezebel talked to the director this week about his film, its politics, and the hope he has for his audience. An edited and condensed transcript of that interview is below. JEZEBEL: Given that the basic outline of this movie is so familiar to pop culture audiences, did you have any trepidation about doing another seemingly post-apocalyptic/outbreak-type movie? TREY EDWARD SHULTS: It started from the personal and it spewed out of me so quick, so it just started there. I wrote it in early 2014 and it didn’t film till 2016, you have a lot of time to think about it. With this is the same way it was with Krisha [his first movie]: Is this going to click with people in a unique way? If you just hear the basic synopsis, it sounds like something you’ve seen before. I just believed we were doing it in the right way and I just had to follow my gut. You also seem to have a lot of confidence in your audience for asking them to invest in a movie that’s subtle and ambiguous. Between your conception and your regard of your audience, it seems like this very bleak movie has a very hopeful meta-narrative. Sure, I love that. It’ll be interesting to see how it goes. I think a lot of people just won’t go for it, but I believe in movies that are open enough to where different people can take different things. I have faith in the audience. Those are the movie that I like and those are the stories I believe in, regardless of genre. If you want to put this in a post-apocalyptic or horror [category], I’m not going to treat it like a different genre in the sense that I’m looking down on it—you gotta treat it with the utmost respect. I wonder if you consciously embedded politics in this movie—it seems like an obvious critique or exploration of the shortcomings of patriarchy, but I wonder if that’s intentional. Sure. I think that’s fascinating. I will say, from a personal level, if I approach the movie intellectually like that it’s almost like I’m leading myself into a corner. For me, I just had to approach it from these characters. I’m not stupid, and I know those themes are in the movie—I think the movie’s about a lot of things—but I just try to be honest with the characters and explore that. And if we’re talking about patriarchy, I don’t know, I’m certainly drawn to Paul’s character. “You can’t trust anyone but family,” is Paul’s stated ethos, and yet society collapses and the movie becomes so psychologically suffocating for the Travis character that the actual message seems to be: You can’t trust anyone—even yourself. I think what it is is how much that fear or whatever you want to call it can infect each and every person, and we kind of experience that through Travis’s nightmares, getting his paranoia and how that’s leading up. I’m just taking it back to the family aspect, too. I think this is a cautionary tale on where things go. It breaks my heart. I don’t want to spoil stuff, but there’s a brokenness. By the end, the inability to trust yourself is there 100 percent. The way you use dreams—placing them so that they feel like the might be real (until a character wakes up) and setting dreams within dreams—reminds me of Luis Buñuel, especially in Belle de Jour and The Discreet Charm of the Bourgeoisie. Was he a direct influence on this movie? I did not draw on Buñuel at all for this movie or think about him, but I love him. I went through a phase in my life where I was living in my parents’ house, had no social life, doing whatever I could to make money, and obsessing about movies and Buñuel was certainly a part of that. We subtly bring you into [the dreams] and envelop you. The [dream sequences] are subtly different [from the reality sequences]. Our film grammar is essentially the same, but what changes is the aspect ratio compresses into 2.75:1 [from 2.40:1] really subtly. We go to anamorphic lenses that are a subtly different feel from the spherical. Our score has its own sonic space that’s a little different from our reality score. Sound is slightly adjusted. Until later in the movie when reality gets to such a terrible place that nightmare and reality converge into one and all the film grammar converges into one. I do this stuff, and I don’t think non-film people will notice at all, but I hope you feel it subconsciously and you’re just pulled into it. You’ve talked about your father’s death inspiring the movie. Was that merely a jumping-off point, or did these other themes such as the one about self-trust come from real experiences too? The movie ends on such a bleak note, and regardless of the meta-textual hope, I wonder where that leaves you at this point. Have you processed and dealt with that death now? Was making this movie adequately cathartic? This movie was a part of me I had to get out, a dark part, and I knew I had to purge it before I could go on. The next movie I want to make is not in this vein. There’s a lot more light and love. It’s all so hard to say because I finished the movie weeks ago, I jumped right into press, I still don’t fully know what the reaction’s gonna be. I’m sitting in the unknown myself.